Block Health Statistician in the Tamilnadu Medical Subordinate Service for the year 2002 - 2006, exam held on 26.02.2011 . Written exam result released on 01.08.2014 [Result]. Selected candidates are requested to attend the Interview on 19.08.2014. Total 52 candidates are shortlisted from written examination. 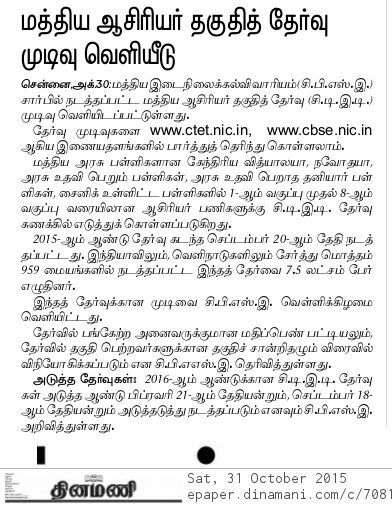 16.12.2015 : Final result has been published on today by tnpsc officials. Oral Test has been postponed, Oral Test will be announced later. Exam : Child Development Project Officer (CDPO) in Social Welfare and Nutritious Meal Programme 117 Vacancies. 234 candidates are provisionally selected for Oral Test (OT) / Personal Interview. Oral Test will be held from 25.08.2015 to 28.08.2015. The Phase 2 list of candidates are provisionally selected for Oral Test (OT) / Personal Interview. Post : Assistant Agricultural Officer (AAO) in Tamil Nadu Agricultural Extension Subordinate Service 2011-2012 for 417 vacancy posts. Personality Test / Interview will be held in AUGUST 2015. Total 65 candidates are provisionally selected from written examination. Exam Result Download : Provisionally selected 3 candidates for certificate verification (CV).